The 1960’s were great years. Elvis was king and was constantly belting out his “hits” and packing more and more money off to the bank. One song he made very popular, which I believe earned him a GOLD, was his rendition of “You ain’t nothing but a Hound Dog.” He’d belt this song, wiggle his pelvis, gyrate back and forth and two-thirds of the girls in the audience would jump, scream and just know they couldn’t live another day without him. The other third had already “frenzied out.” Such was the effect his hound dog singing had on our younger generation. What a great era! But for the Air Force, another type of Hound Dog was being developed and deployed. These were sinister, deadly dogs definitely not designed to titillate, inspire or affect mankind except in a very deadly way. This Hound Dog was the super sonic GAM 77/AGM-28 (guided air missile and air to ground missile.) They were developed and built by the North American Aviation Company, later named Rockwell International, and were intended for use by the Strategic Air Command’s all jet bombers, primarily the B-52. 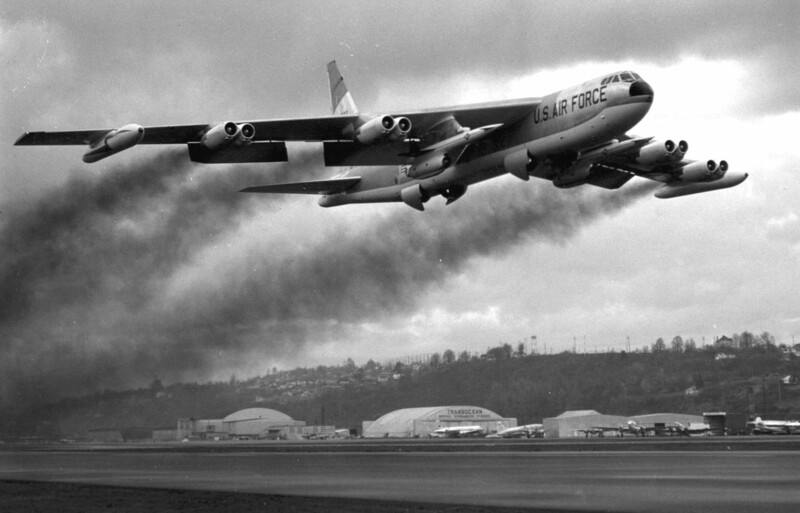 I was an Aircraft Commander/Instructor pilot in the B-52 from early 1957 to many years later. I was assigned to the 92 Bomb Wing (H) Fairchild AFB, WA. where we had three squadrons of B-52 D’s. Besides flying training missions on a frequent and regular schedule, we maintained an around the clock alert force. A percentage of our aircraft were “loaded and ready to go” constantly. Assigned flight and ground crews slept near their aircraft, with the required “off the ground time” being measured in minutes. This was the COLD WAR era. Then we had two super powers in the world. One we considered good and worthy of that honor and one we felt was dedicated to the destruction of the way of life we had come to expect, love and protect. President Reagan later referred to that other power, Russia, as “the evil empire.” Since the cold war showed no signs of ending and oscillated from hot to at best just cool, everyone wondered how it would eventually play out. I don’t think anyone could hazard much more than a WAG (wild assumed guess) and they aren’t too accurate. Looking back, it was a certainty neither our diplomat’s nor theirs had the answers. All were so intent on playing the game and keeping us even that very few reliable, workable long range plans were formulated. With this background and with our intelligence people telling us how far we were behind, how advanced they were (they put up Sputnik first, didn’t they?) our Research and Development (R&D) people were going full blast. The media was always there to make headlines and to keep the people informed. Our government and the military were working under the TRIAD system of defense. The three forces at their disposal were land, air and under water. Massive ground based static missiles were in their hardened silos and fairly well protected. Submarines comprised the underwater portion and with their stealth were considered almost invulnerable. The third leg, the air delivery system using sub-sonic jet bombers was at the highest risk. Not only were advanced super-sonic fighters developed and deployed, but Russia was defending many of the targets we considered prime with multi-rings of ground to air missiles. And these missiles had an accuracy that would make any sane person stop and think. So what could we do, since it was felt airborne bombing was an absolute necessity, if it ever came to that. About then Gary Powers proved that even 80 some-odd thousand feet up wasn’t enough protection. With the B-52’s operational limit at less than 50,000 feet, something had to be done. The brainy ones came up with the big idea. If we just had a “something” we could stand way back and toss at them from the air, think of the advantage we’d have. So the airborne missile concept came into being. At one time it was called a “stand-off” missile, since you need approach a target only within the range limit of the missile to “let ‘er go!” It would hit the target long before you arrived to, hopefully, negate the defenses considerably. The HOUND DOG, a 42 foot long, 10,140 pound missile with a W-28 warhead capability of up to four megatons became part of SAC’s atomic munitions in 1961 and remained active until 1976. It was the first airborne missile to be operational. With a service ceiling of 55,000ft and a range of 700 miles at a speed of 2.1 Mach, it was a real addition to the SAC’s arsenal. It could be programmed for low level, tree skimming flight as well as for high altitude delivery. It contained its own inertial guidance system, (this was way before the GPS system was developed) which could be updated just prior to release by the aircraft’s on board system. It’s jet engine could be used for additional power for take off and the fuel tanks “topped off” prior to release. For those of us with targets assigned deep within “the evil empire”, they were a most welcome addition. By late summer 1962 construction was completed on the new maintenance building at Fairchild AFB, WA to provide for and maintain the Hound Dog. Adaptation kits were installed under each wing of our B-52’s to enable us to carry one missile under each wing. Toward the end of the year, the powers to be thought we were sufficiently ready and directed the Wing to begin receiving its allotment of these honeys. By now our crew had earned Select Status with primary duty in the flying Standardization/Evaluation section of the Wing. In early December 1962 my crew was picked to fly to Eglin AFB, FL, to pick up and return two AGM/28’s to Fairchild. We arrived at Eglin on Dec. 2, 1962 completed a ground course on in-flight procedures and were qualified to fly carrying missiles. This made us the first air-crew from our Wing to be so qualified. Our return trip was on Pearl Harbor day, December 7, 1962. We delivered by air, the first two airborne missiles, the AGM-28’s, ever based at Fairchild AFB. It didn’t take long until others arrived (how, I’m not real sure) but the first two were obtained by my crew and they arrived by “B-52 air express”. We were told we’d “never know they were on board” as far as the aircraft’s flying characteristics were concerned and that was correct. Couldn’t tell it at all. No buzzing, vibrations or anything. Just the extra weight to consider when doing the weight and balance computations. We never needed the additional power from their engines for take off, so never used them. Also, being so low to the ground, their engines worked like excellent vacuum cleaners, sucking up every bit of debris from the runway. The Radar Navigator and the Aircraft Commander each had a control box by which we could “arm” the weapon’s nuclear warhead in flight. It required switches at both stations to be activated within a very short time frame. Remember the “Two Man” principle? It took two equally qualified individuals to do anything to or with an atomic weapon. The R/N also had a guidance control box, to set, update or change in flight the missiles target coordinates. It proved to be a very reliable weapon system and gave us very little worry. The only “ready to use” ones I ever carried were during our airborne alert missions during the more heated phases of the cold war. With the proper message, all hell would’ve broken loose. Atomic bombs would have been going off like popcorn. Had this happened we’d all have been heavy losers. The world would never have been the same, even if any of us had survived. The Hound Dog was a very versatile weapon system. It could be launched from low level, going all the way low level, or it could be programmed to “pop-up” to any altitude prior to detonation. It could also be launched from hi-level. It’s 700 mile range made it an ideal “stand-off” weapon, or as we were programmed to use it, as a weapon to help us penetrate. By launching this some 60-70 minutes before our O.T.T. (over-the-target-time,) we hoped the defense system around our target would be severely downgraded. Of the 772 missiles known to be constructed, 600 are known to have been deployed. I am not aware of any launches while I was active with them, other than a few for testing at Eglin AFB, or Vandenberg. To effect a launch, after receiving the properly encoded message, we were to check and update the launch position, and the intended target position. After these settings were made and verified, we would start the engines, cause the warhead to “arm” and the weapon would be ready for launch. Launch required a flipped switch by both the radar-navigator and the pilot, within a very short time. I never launched one, but my understanding is that they would drop slightly, then speed away, going super sonic (2.1 mach) on their way to the programmed target. I don’t believe their speed could be varied nor controlled. Having them in the inventory gave us another ground school item to keep up with and another element for all kinds of malfunctions to cope with in the simulator. But this was good. Repeated training makes safer crews. That is what helped our wing maintain and safely use these missiles until they were phased out in 1976. As far as I know, we never had a reportable accident with them. I know that none were ever accidentally dropped from any of our planes. 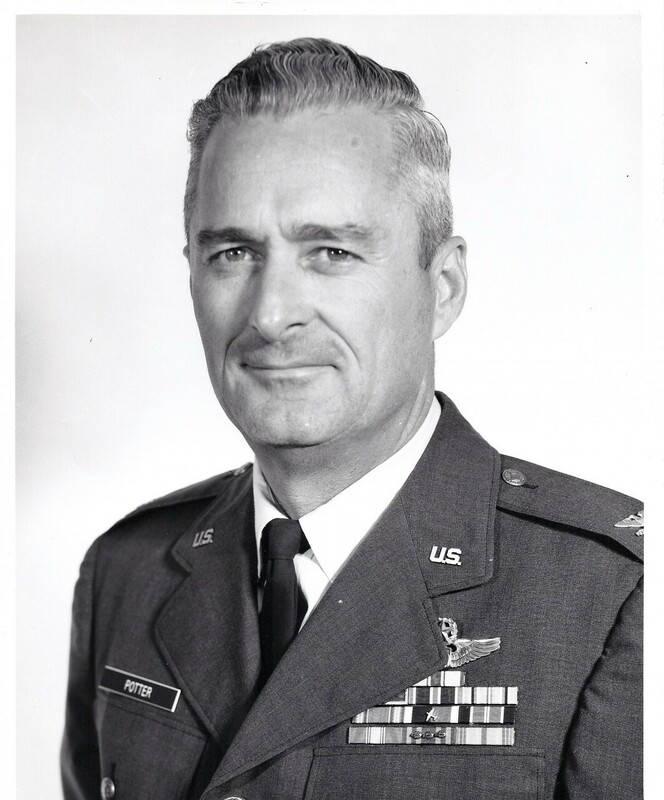 So, here’s another bit of history from the life of the now disbanded Strategic Air Command, the force first entrusted with atomic weapons and with such knowledge helped WIN the cold war. My surviving crew members and I are probably the only ones who know that we delivered the very first two airborne missiles, a pair of Hound Dogs to Fairchild AFB. To mention it to others now brings a “so what” type of response. The Hound Dog is way back in history and forgotten, or never known by most current personnel. But that is the way history flows. Those involved remember, those who only watch are seldom impressed and much less likely to remember or even care. History marches on, thankfully or we’d still be crossing swords and throwing spears. Seems there’s always another current crisis which requires our attention. Our every-day problems are what’s most important to us. The way is should be. ← An Unexpected Flying Experience, Decompression!